Genus: Cephrenes Waterhouse & Lyell, 1914. Caterpillar Local Host Plants: Cocos nucifera (Arecaceae; common name: Coconut), Livistona sp. (Arecaceae), Cyrtostachys renda (Arecaceae; common name: Lipstick Palm). A female Yellow Palm Dart. A male Yellow Palm Dart. The adults are similar to Telicota spp. in appearance but somewhat larger. 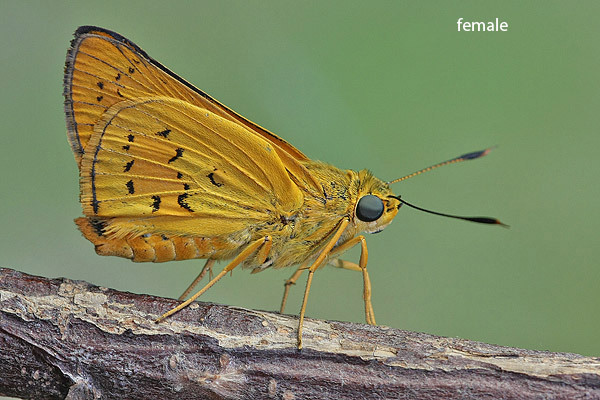 Unlike the Telicota spp, the male lacks a stigma (a secondary sexual characteristics). 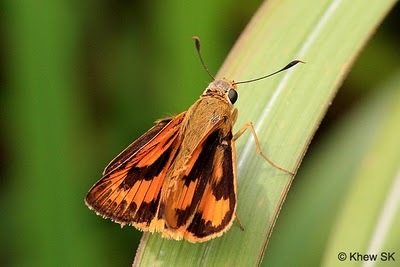 Above, the wings are dark brown to black with prominent orange-yellow streaks and spots that are typical of the genera Telicota and Cephrenes (with a costal streak joining a band of 3 subapical spots in spaces 6-8, a post-discal series of spots from spaces 1b to 5, and finally two streaks along the dorsum below vein 1b). The orange-yellow colour of the post-discal band on the forewing is contnued along the veins towards the termen. 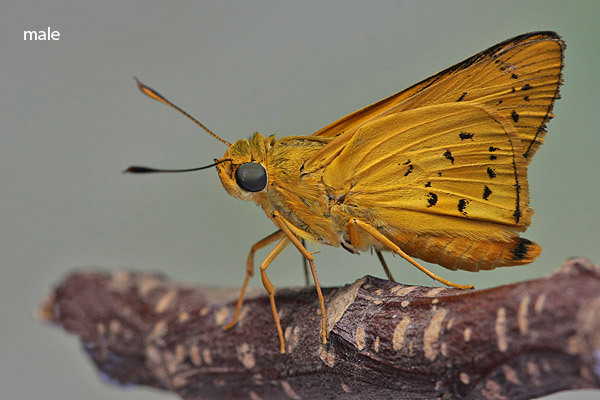 Beneath, the wings are a deep yellow with post-discal spots matching those on the upperside. The post-discal bands on both wings occur in a darker shade of yellow against the ground colouration and are distinctly edged with short, bold and thickened black-brown markings. There is a rather large black-brown tornal patch in the hindwing. 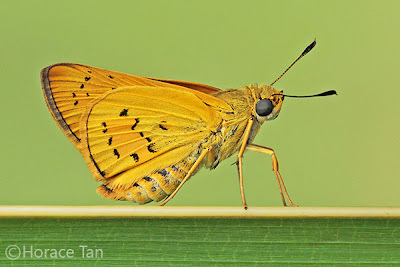 A female Yellow Palm Dart sunbathing with partially open wings. A Yellow Palm Dart perching on a coconut frond in the late afternoon sun. 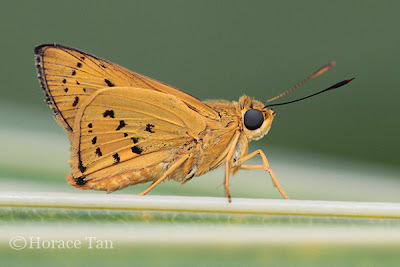 Since its recent discovery and addition to the Singapore checklist, the Yellow Palm Dart has established itself firmly in Singapore with a moderately common status. 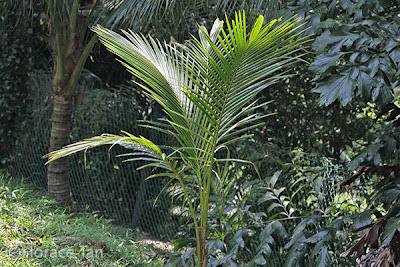 Sightings are rather frequent and spread over many parts of Singapore, at locations such as neighbourhood parks, certain offshore island, wastelands, park connectors and even in housing estates and business districts where its host plants (various Palm spp.) are present. 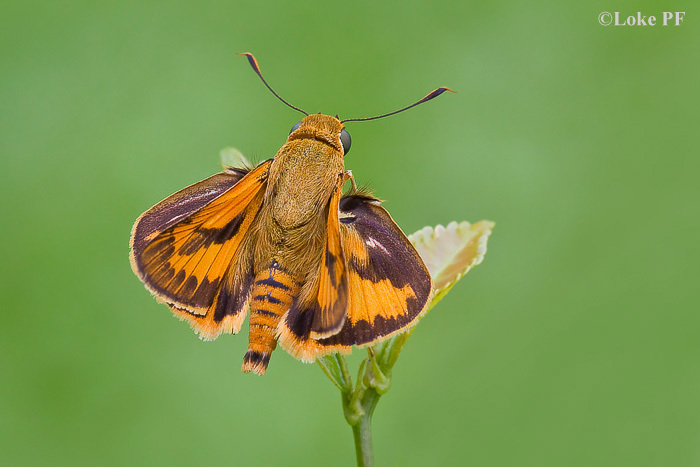 The swift flying adults have been observed to visit flowers and sunbath in sunny weather. 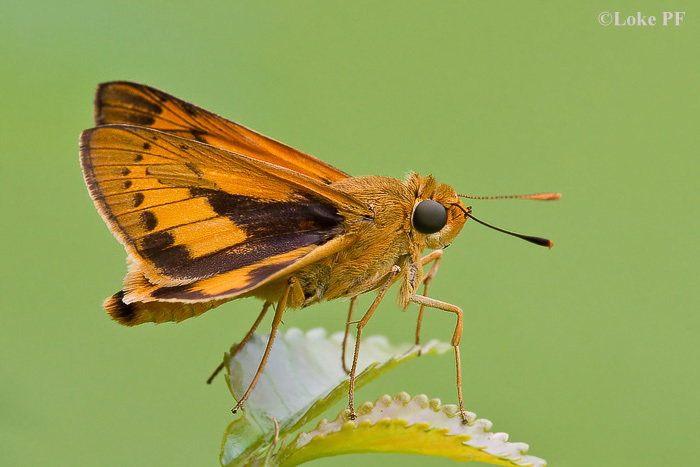 Yellow Palm Dart is known to utilize a number of Palm spp. in its down under homeland in Australia. 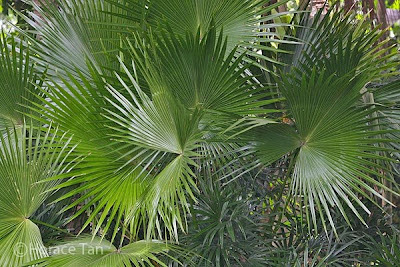 Locally in Singapore, it has been observed to utilize the Coconut Palm, Livistonia spp. and the Lipstick Palm as its larval hosts. Among these, the Coconut Palm appears to be the most favoured local host plant. 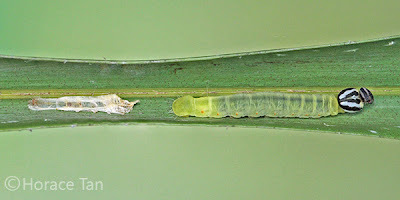 The caterpillars of the Yellow Palm Dart feed on the leaves of the host plant in all instars, and live in leaf shelters. 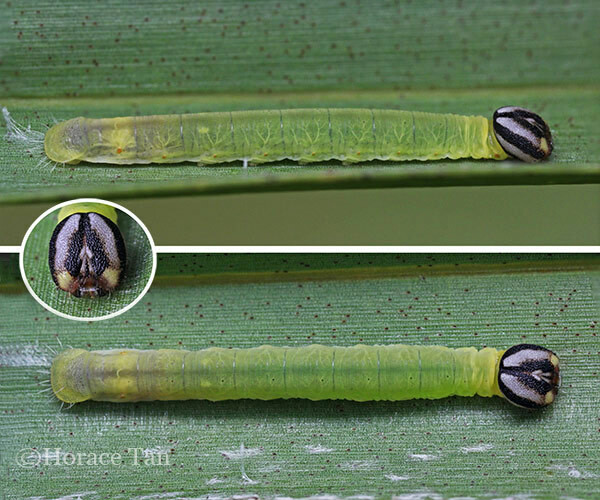 As the caterpillar grows in size later through progressing instars, it will move to ever larger shelters built by joining cut leaf fragments or two adjacent leaflets. 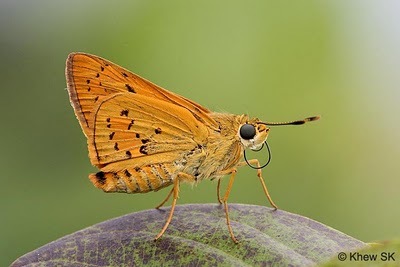 One noteworthy point is that, unlike most other skipper caterpillars, the immature stages of the Yellow Palm Dart do not take much care in catapulting their frass pellets away from its shelter. It is a common sight that a leaf shelter for the Yellow Palm Dart houses both the caterpillar (up to the penultimate instar) and a considerable collection of frass pellets. Host plant #1: Coconut Palm. Host plant #2: Livistona sp. 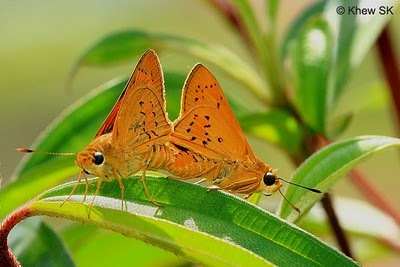 A mating pair of the Yellow Palm Dart. 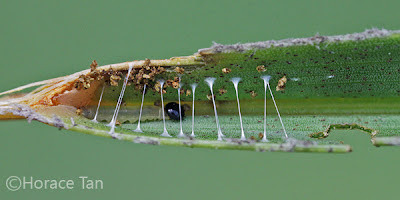 The eggs are laid singly on a leaf of the host plant, typically on the underside, or on the rachis or petiole of a leaf frond. Each dome-shaped egg is initially yellowish orange and appears to be smooth to the naked eyes. A closer inspection reveals numerous short, discontinuous and irregular tiny ridges running in a longitudinal direction. The micropylar sits atop in a darker shade of yellowish orange. 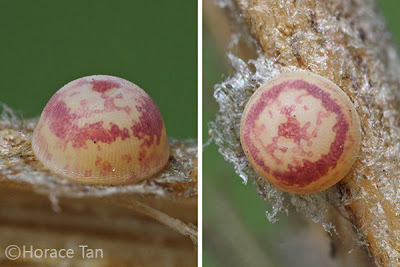 The eggs are rather large with a diameter of about 1.4-1.5mm. Two views of an egg of the Yellow Palm Dart, diameter: 1.4-1.5mm. It takes about 5 days for the egg to hatch. The egg develops red mottled patches on the pole and roughly in an equatorial belt a day later, and then turns dark purplish red to pale brown entering the 4th day. 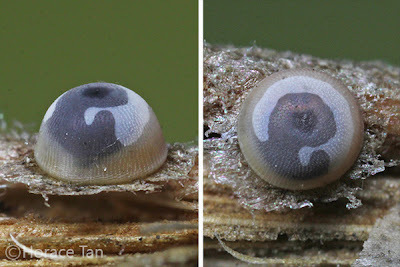 At this point, the dark head capsule is visible through the egg shell. Finally the egg decolorises to a whitish coloration as it enters the last day of the egg development phase. 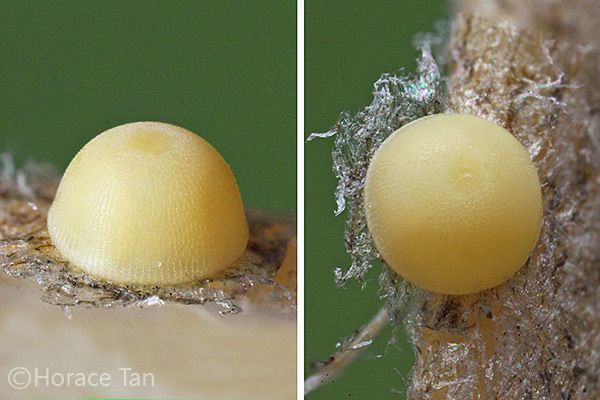 Two views of a developing egg of the Yellow Palm Dart, one-day old. Two views of a near mature egg, 4-day old. 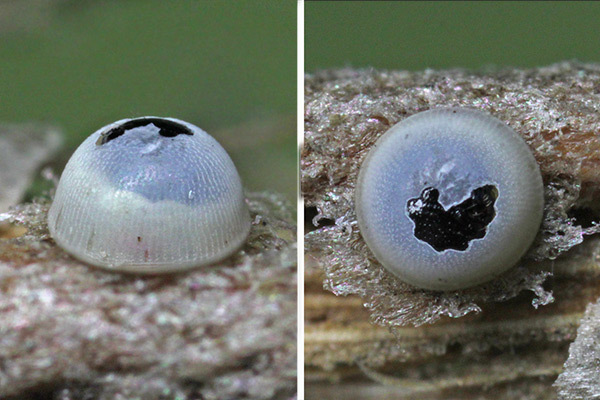 Two views of a mature egg with nibbling of egg shell commenced, 5-day old. 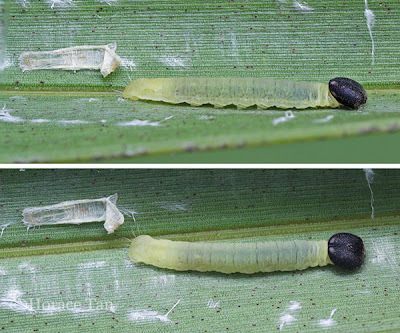 An animated sequence showing the egg shell being nibbled away by the caterpillar prior to its emergence through the hole made. Note the egg shell is eventually eaten by the newly hatched, sans the egg base. 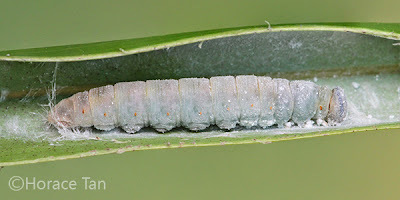 The young caterpillar eats just enough of the shell to emerge, and then immediately proceeds to finish the remaining egg shell (see video clip below). The newly hatched has a length of about 3.5mm. 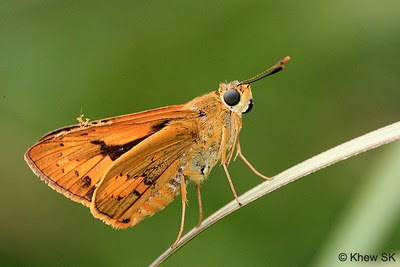 Its pale yellowish brown body is cylindrical in shape with a small number of very short and tiny dorso-lateral and lateral setae. There is a tuff of moderately long setae on the posterior segment. The last 2-3 posterior segments are adorned with reddish to orangy mottled patches on the dorusm. Its head is black with a black collar lying behind it on the prothorax. 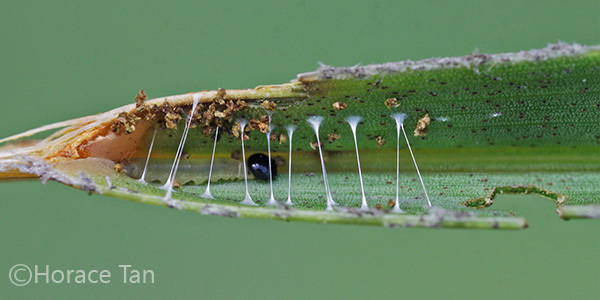 A Yellow Palm Dart caterpillar emerges from its egg. 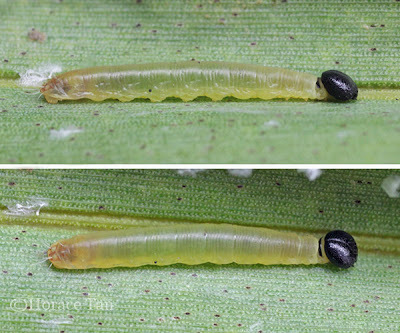 Two views of a newly hatched 1st instar caterpillar, length: 3.5mm. After consuming the egg shell, the newly hatched caterpillar constructs its first leaf shelter, typically at the tip of a leaflet of the palm frond. The body takes on a slight green undertone after a few feeding sessions on the leaf. 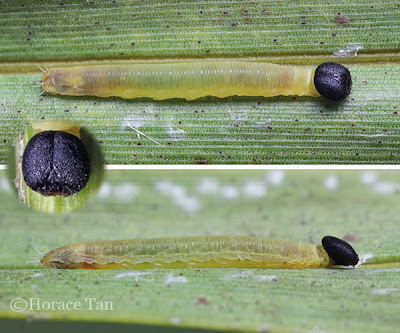 The 1st instar takes a total of 2-3 days to complete with body length reaching about 7mm. 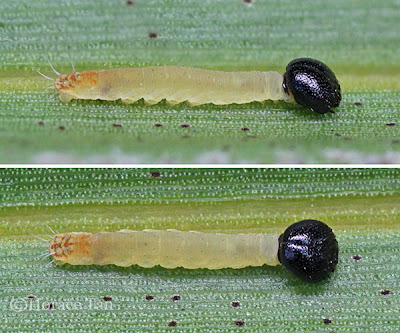 Two views of a 1st instar caterpillar, late in this stage, length: 7mm. A 1st instar caterpillar in its leaf shelter, with a collection of frass pellets nearby. Note the adjacent feeding site. 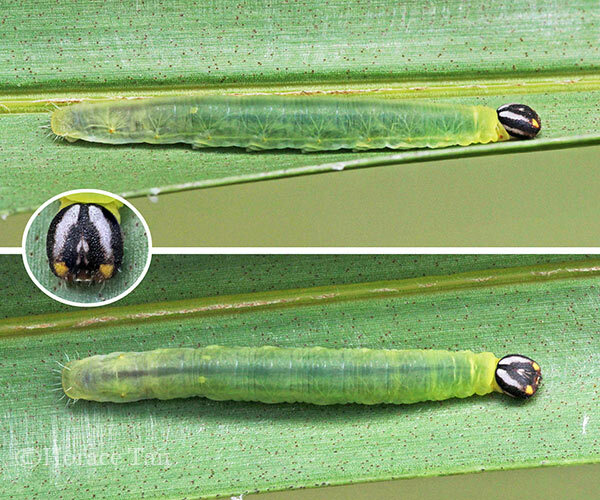 The body of the 2nd instar caterpillar resembles that of the first instar, but with the dark collar on the prothorax now absent. The tuff of long setae at the posterior end is still present together with the reddish to orangy patches on the dorsum of the posterior segment (less conspicuous). This instar lasts a total of 3-4 days with the body length reaching up to 10-11mm. 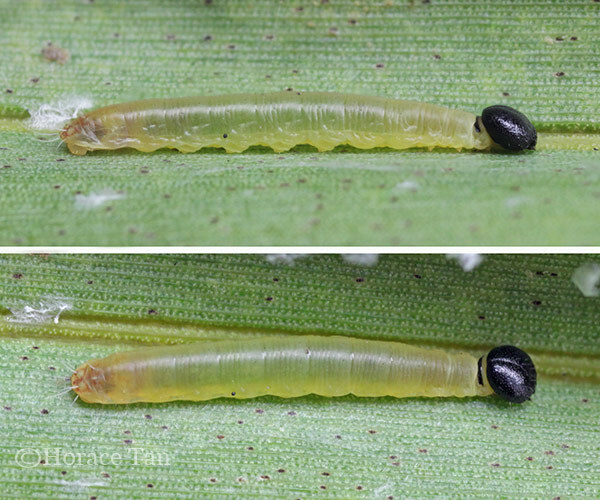 Two views of a 2nd instar caterpillar, newly moulted, length: 7.5mm. 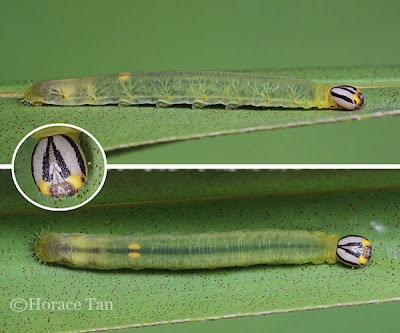 The 3nd instar caterpillar resembles the 2nd instar caterpillar except for a more yellowish green body colour, the absence of the red/brown markings on the dorsum of the posterior segment, and a change in marking on the head capsule. Whilst a minority of specimens still sport a totally black head capsule, most have two whitish patches of varying extent on both sides of the head capsule (see picture below). This instar lasts a total of 3-4 days with the body length reaching up to 15-16mm. 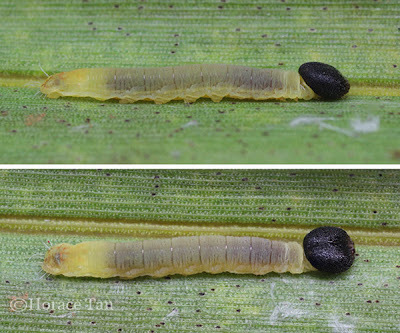 Two views of a newly moulted 3rd instar caterpillar. Two views of a 3rd instar caterpillar, length: 14mm. Heads of four 3rd instar caterpillars, showing variation in markings. The 4th instar caterpillar differs from the 3rd instar caterpillar in having two yellowish "cheek" patches on the head capsule, one on either side of the mouth parts. In the head capsule, the lateral white patches elongates and enlarges to differing extent in different specimens, with some having the white patch reaching down to the yellow "check" patch (see picture below). This instar lasts 3-4 days with the body length reaching up to 26-28mm. 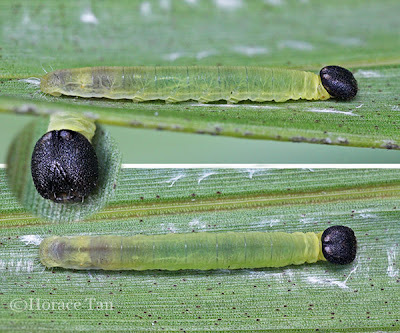 Two views of a 4th instar caterpillar, early in this stage, length: 18mm. 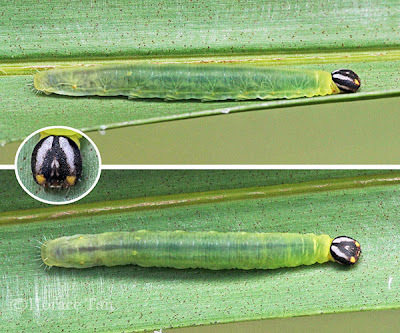 Two views of a 4th instar caterpillar, late this stage, length: 26.5mm. Heads of four 4th instar caterpillars, showing variation in markings. Again the change from the 4th instar to the 5th takes place on the head capsule with most specimens possessing a head dominated by the two large white lateral patches, with the back bands lining the epicranial suture varying in thickness (see picture below). Two views of a male 5th instar caterpillar, late in this stage, length: 35mm. The 5th instar takes about 6-7 days to complete with the body length reaching up to 39-41mm, In the last 2 days of this instar, except for the yellow-dominated dorsum, the body takes on a strong jade green coloration changing into purplish blue in the last day. The caterpillar ceases feeding and its body shrinks to about 34mm. Next it proceeds to seal the shelter it is in with silk threads. Two views of a 5th instar caterpillar, late in this stage, length: 41mm. Heads of four 5th instar caterpillars, showing variation in markings. Two views of a 5th instar caterpillar, with body color changes prior to becoming a dormant pre-pupa, length: 34mm. 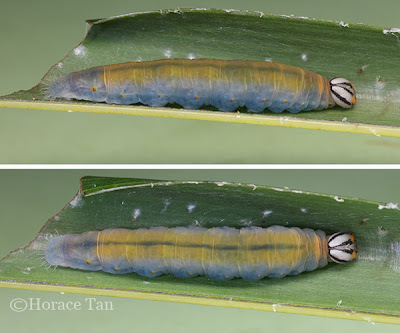 Towards the end of 5th instar, the body of the caterpillar shortens appreciably. Soon the caterpillar becomes dormant in the pupation shelter. 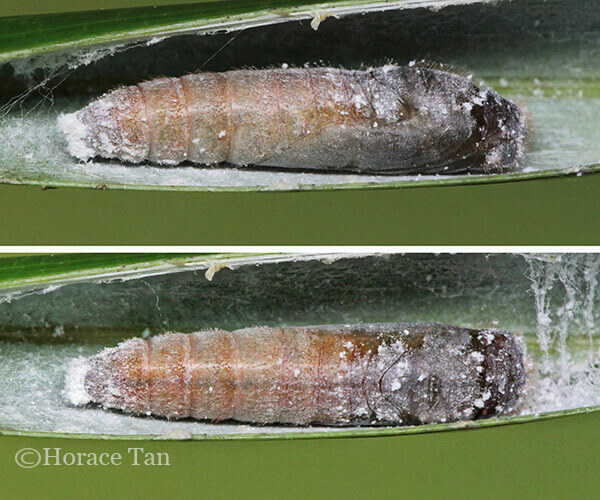 In the tightly closed pupation shelter, the caterpillar also secretes large quantity of a whitish waxy substance. This prepupatory phase lasts for 1-1.5 days. A pupation shelter opened to reveal a pre-pupa of The Yellow Palm Dart. Pupation takes place within the leaf shelter. The pupa does not have a cremastral attachment nor a silk girdle and it is mainly secured with tightly woven silk threads in the shelter. It has a short thorax, a rather long abdomen, a short and pointed rostrum. The body is dark brown in the thorax and wing pad areas, but pale reddish brown in the abdomen. Length of pupae: 23-24mm. 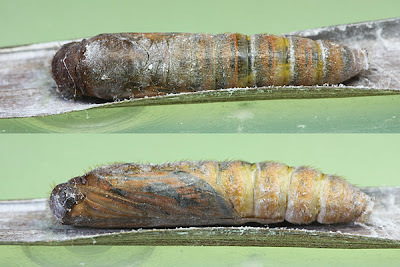 After 9 days, the pupa becomes mostly golden brown with the wing pad areas in darker brown and showing the orange markings present on the forewing upperside. Eclosion takes place the next day. 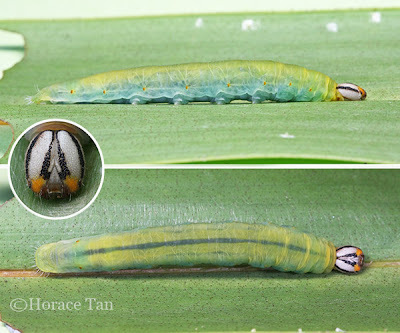 Two views of a mature pupa of the Yellow Palm Dart. A newly eclosed Yellow Palm Dart. Oviposition and territorial behaviour in Cephrenes trichopepla and a new distribution record, Dunn K.L., Victorian Ent., 24(1), pp.21-25, 1994. Notes on the biology and new larval hosts of Cephrenes - Part II, Dunn K.L., Victorian Ent. 25(1), pp.3-12, 1995. The Butterflies of Australia, M. Brady, CSIRO Publishing, 2000.